Kapoho Oceanfront Home for rent by owner is the ideal clean and affordable Hawaiian vacation rental for families. Filled with charm and good spirit, this spacious two bedroom offers guests outstanding ocean views from every room. The private vacation rental was once a meeting place for sugar plantation workers and through the years, the classic home has been the site of many happy gatherings on Hawaii's eastern shore. 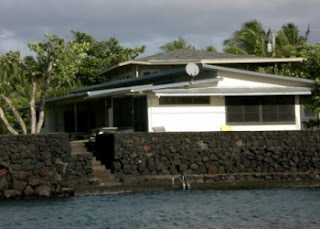 This terrific oceanfront vacation rental on Kapoho Bay includes a high-speed Internet connection, satellite tv and a stereo system with cd and dvd player. The open kitchen offers a full sized refrigerator, oven, cook-top, microwave, toaster, coffee maker, coffee grinder, rice cooker, paper supplies and amazing views of the Pacific Ocean. Kapoho Oceanfront Home, Sleeps 13 Beach Home w/Fishing Wall!